This mission is an important one for the space station and its European partners. 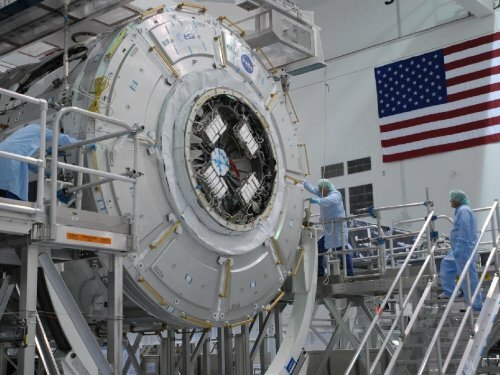 Endeavour will deliver Node 3, named Tranquility, and the Cupola, a robotic control station with six windows around its sides and another in the center that provides a 360-degree view around the station. At least three spacewalks are planned during this, the 32nd space shuttle assembly mission to the space station. Tranquility was built under management of NASA’s partners in the European Space Agency and the Italian Space Agency by Thales Alenia Space for the Space Station Program. The Cupola, a large window module and robotics work station will be attached to the nadir-side (down looking) of Tranquility. The module also includes various critical space station systems, especially life support systems. Designed and built by the Italian contractor Alenia, it is approximately six feet in diameter and three feet tall. It has six side windows and a top window, all of which are equipped with shutters to protect them from damage by micrometeorites and orbital debris. It features a thermal control system, audio, video, as well as the connections needed for installing in it one of the two identical robotic workstations that control the Canadarm2. It will initially be installed on the Unity Module and later be transferred to the Tranquility module of the space station. The Italian Space Agency also built all three space station nodes; Unity, Harmony and Tranquility; as well as all three multipurpose logistics modules (MPLMs): Leonardo, Raffaello and Donnatello. The MPLMs are used to transport up to 10 tons of cargo to the space station each mission. It’s the third day at sea, and I’m standing near the stern of Liberty Star, staring back at Pegasus and thinking about our VIP, ET-134. 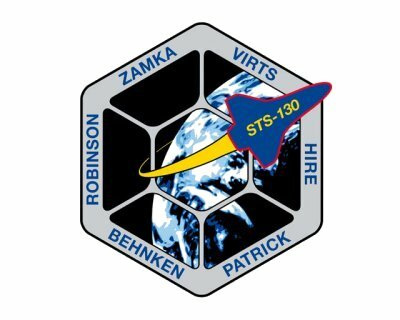 It’s mid October and ET-134 will fly with STS-130 in February; with Endeavour Commander George Zamka and Pilot Terry Virts Jr.; and fly with Mission Specialists Bob Behnken, Nicholas Patrick, Kathryn Hire and Steve Robinson. The duration of ET-134’s mission will be completed in about eight minutes and thirty seconds, but it will travel a total of 13,690 miles in 73 minutes. The solid rocket boosters, the space shuttle main engines and orbiter Endeavour will all return from space to be rebuilt, refurbished and reconditioned, but ET-134 will give everything it has to its mission and it will not return home to fly again. ET-134, like all external tanks, is constructed of aluminum and steel alloys and titanium. The majority of the tank has one-inch thick spray-on foam insulation that is applied to its exterior. This foam insulation maintains the propellants at an acceptable temperature, minimizes ice build-up on the launch pad and protects the tank from booster, main engine and aerodynamic heating during launch. It has a propellant feed system that supplies the liquid fuel and oxygen to the orbiter engines; a pressurization and vent system to regulate its pressure; an electrical system to distribute power; and an environmental system to regulate the temperature and atmosphere in the intertank. The intertank is not a tank itself, but the mechanical connection between the liquid oxygen and liquid hydrogen tanks. Its primary function is to provide structural continuity to the propellant tanks, to serve as a protective compartment to house instruments, and to receive and distribute thrust loads from the solid rocket boosters. At 370,000 feet or about 70 miles above the Atlantic Ocean and about eight minutes, thirty seconds into the flight at 17,000 miles per hour, ET-134 will complete its mission of fueling the three voracious space shuttle main engines. On cue in this carefully choreographed series of events during ascent, the engines will shut down, immediately followed by the firing of pyrotechnique devices to separate the orbiter from the external tank. When seen on NASA television it appears that the space shuttle pulls away from the external tank, seemingly anxious to continue its own mission to fly on to the International Space Station. Actually, 11 seconds after main engine cut-off computers command the orbiter to fire a series of maneuvering jets and push forward along the external tank passing at a safe distance and at about 20 feet per second. Then the orbiter does a back flip; nose pitching up 90 degrees. As the back flip is completed, the orbiter is some 7,000 feet away and STS-130 Mission Specialists Bob Behnken and Kathryn Hire, who have already left their seats, will retrieve photographic still and video cameras from special lockers and begin filming ET-134 as the tank and orbiter fly in rough formation for a few moments. These images, eagerly awaited by image interpreters and photographic experts at Marshall Space Flight Center in Huntsville, Ala., the Johnson Space Center in Houston, Texas and the Kennedy Space Center, Fla., are critically important as a source of information to confirm the performance of the external tank thermal protection system during ascent. 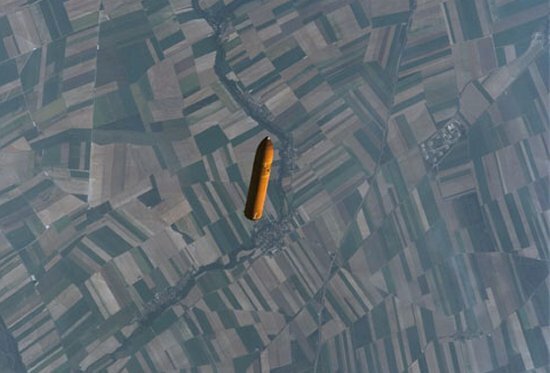 A space shuttle external tank falls toward Earth after a successful launch. Mission Specialists Bob Behnken and Kathryn Hire will be the last people to see ET-134, as it slowly slips away. 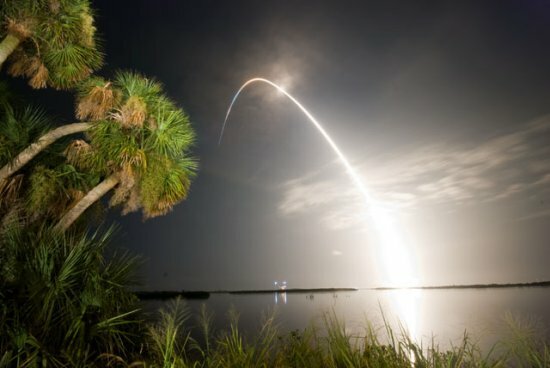 If all has gone according to plan, a few days later, experts on the ground will confirm that ET-134 has performed its mission to deliver the crew and orbiter with minimal loss of foam, thus guaranteeing the safe continuation of the mission to the space station and its return to Earth. Now ET-134 will continue on its own sub-orbital trajectory, reaching its apogee of 130 miles and then fall away toward the Earth. At this point ET-134 will be flying alone, no propulsion, no direction changes, sailing on its fixed azimuth over Europe on a planned trajectory across southwest Asia and the Indian Ocean and ultimately south of Australia. Over the Pacific Ocean, south of Tasmania, ET-134 will encounter the upper atmosphere. Here it will begin to heat up and disintegrate. At this point it is important that ET-134 holds together just long enough, but not too long. The lower in the atmosphere the ET-134 plunges before breaking apart the smaller the footprint of possible debris reaching the Earth’s surface. Special BX foam on the liquid oxygen feed line will break off early in just the desired sequence causing hot gases to penetrate the line and initiate the final break up. After a fiery descent through the atmosphere, ET-134 will no longer hold together, and will break up into hundreds of small pieces of metal and plunge toward the 11,000 foot depths of the southwestern Pacific Ocean, east of Australia, New Zealand and Tasmania. In the deep of the blue-green Pacific Ocean, ET-134 will join the long gone remnants of thousands of other sailing ships as well as the sailors and explorers of every sea-faring nation of the Earth. ET-134 will be in good company.